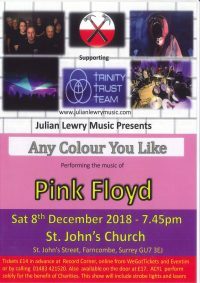 Any Colour You Like* performing the music of Pink Floyd at Farncombe Music Club, St John’s Church, Farncombe, Godalming, GU7 3EJ on Saturday, 8 December 2018. This show will include strobe lights and lasers. Advance Tickets: £14 (£17 on the door) available from Record Corner, Eventim, WeGotTickets or call 01483 421520. *Any Colour You Like perform solely for the benefit of charities.